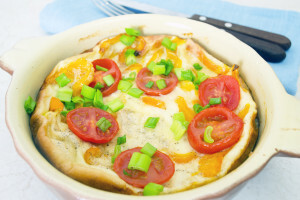 This Frittata is a twist on the usual pizza. Make sure you let the cheese get good and melted. If you are a mushroom fan you could add some baby portables to it. This recipe is perfect for entertaining in the summer when the tomatoes are fresh and ripe. Fresh basil puts this Frittata over the top! Preheat the broiler. Beat the eggs with the milk in a bowl. Heat the olive oil in a cast iron skillet over medium heat. Pour the beaten eggs and milk into skillet. Scatter the tomatoes, cheese, green onion and basil over the eggs. Season with salt and pepper. When the bottom just begins to brown, place the skillet under the broiler just until the top is set, 1-2 minutes. Remove from the oven and transfer to a platter using a large spatula. Cool about 10 minutes, cut into wedges and serve.